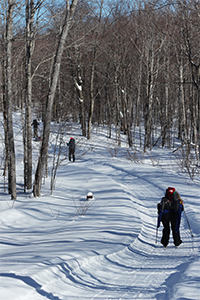 Patten, ME — Friends of Katahdin Woods and Waters (Friends) will be hosting the sixth annual Head North Ski Days in the north end of Katahdin Woods and Waters National Monument (the Monument) from Saturday, March 16th to Friday, March 22nd. With the help of local volunteers and Friends’ community partners at Elliotsville Plantation, Inc, event attendees are invited to borrow free cross-country ski or snowshoe equipment at the North Gate of the Monument. Friends Education Coordinator Kala Rush will be hosting visitors as well as students from across the Katahdin Region. 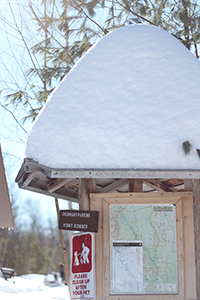 From March 16th to March 22nd, starting each day at 10 AM, the public will have access to free cross-country skis, boots, and poles provided by Outdoor Sport Institute as well as snowshoe equipment from the Katahdin Gear Library. Volunteers will help visitors set up equipment and can offer recommendations for enjoying the trails system. Adventurers interested in a backcountry overnight experience are invited to reach out to Friends to plan an extended trip. “Whether you’re out for half a day or a couple of nights, the 16-plus miles of groomed trails offer excellent skiing and snowshoeing with some breathtaking views of the East Branch of the Penobscot, Bald Mountain, Traveler Mountain, and more,” said Kala Rush. Elliotsville Plantation, Inc. started Head North Ski Days in 2014 to showcase what was then a recreation area before the historic land gift that led to the designation of Katahdin Woods and Waters National Monument in August 2016. With generous support from local Maine sponsors Shin Pond Village, Richardson’s Hardware, and Emerald Builders, Friends continues to host the event and offer free equipment for visitors from the Katahdin Region, Maine, and around New England. “We’re proud to have the support of Maine businesses and organizations that understand the importance of Maine’s woods and waters. The Monument community spans the Katahdin Region and beyond and this event has received support from Mt. Chase, Patten, Millinocket, Farmington, Bowdoinham, and Caribou,” said Kala Rush. The Katahdin Learning Project is Friends’ place-based learning initiative in the Katahdin Region with the intent of getting students and the broader community outside and connected to the Monument. Education Coordinator Kala Rush recorded the radio spot while teaching local students about audio production as part of a Katahdin Learning Project “learning journey.” During Head North Ski Days, students from schools in Millinocket, Medway, Stacyville, and Patten will have the opportunity to enjoy the north end of the Monument with Kala and teacher chaperones. For more information about Head North Ski Days, please visit the Friends website. 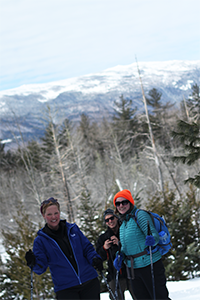 Presidents’ Day weekend, the full staff of the Friends of Katahdin Woods and Waters (all four of us!) headed into the north end of the Monument for some quality time together. I just came on as the new Friends Membership Coordinator at the end of January, so I was excited to spend a few days with my new colleagues and, of course, for the opportunity to do some skiing and snowshoeing in the Monument. Though I lived in Millinocket for a year, I have yet to explore the Monument as fully as I’d like to. On the bright side, this means that I can still experience a lot of the beauty and splendor of Katahdin Woods and Waters for the first time! 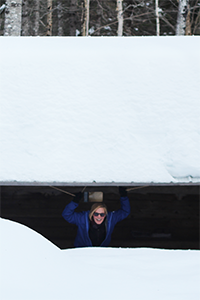 As we set out on our trip, I was particularly looking forward to stretching my cross-country skiing muscles and enjoying the bountiful snow up north. Leaving Portland, the scraps of snow on the curbs were dirty, icy, and uninspiring. By the time we turned off the highway in Sherman, though…wow. I have to admit, the enormous banks of snow and pristine-looking snow-covered hills and mountains are impressive, no matter how many times you’ve seen them. After spending the night with our friends and Monument partners, Susan and Mark, we got a good start on Sunday, filling up with a fantastic and hearty breakfast at Shin Pond Village. Swallowing another cup of coffee and staving off the urge for a post-brunch nap (that might have just been me), we headed out over the winding roads to Matagamon Gate, parked, and loaded up our packs and ski pulks. We had a quick photo op and waved goodbye as Susan, Mark, and fabulous VIP Connie headed off to groom and break snowshoe trails elsewhere in the Monument. We were ready to go! …Except that, for some reason, Sam and Kala’s skis decided to be difficult, refusing to latch into their ski boots. It looked like it was going to be a long snowshoeing trip for the two of them until, by a fortuitous twist of fate, someone suggested they switch skis and see if that worked. Kismet! Providence! Snap, snap, snap, snap, their boots latched right into the switched skis (we make a good team), and we were ready to go. Off we went, skiing down the beautifully groomed trail toward Haskell Hut, our home for the next two nights. I wouldn’t call myself an expert skier, but I grew up skiing about on cross-country skis in the winter in my family’s backfield. Compared to breaking trail in a field (or “generously” letting my older brother go ahead of me to break trail), the groomed trails of the Monument are a dream! Of course, it was the beginning of the trip and I had lucked out and wasn’t dragging a ski pulk, but I felt light and zippy as we headed off down the Messer Pond Road. The air was crisp and cold, but the wind was calm, the sun was bright, and we were warmly dressed, so it was very comfortable skiing. We paused to look at Billfish Mountain, sparkling in the brilliant sunshine, but continued on soon so that we could reach our destination and drop our bags. We reached Haskell Hut in good time, with a couple of hours until sunset. Kala soon had a fire built up in the woodstove, and we grew warm and comfortable in the hut. We briefly considered going out again for a late afternoon/evening ski, but the coziness overtook us, and we decided to stay in, make some dinner, and relax for the evening. Before long, Andy had whipped up a fantastic meal of pasta with shrimp and vegetables in a creamy sauce that would not have been out of place at a fancy restaurant. We sopped up every drop of the extra sauce with some bread I’d brought along and soon leaned back in our chairs, well fed and contented. The next morning, after some expertly-brewed coffee, sizzling bacon, and maple-y oatmeal and from Kala, we set out for a day of adventure. We decided to leave our options open, but we brought along our day packs and a ski pulk with our snowshoes so that we could try to snowshoe up to the Lookout. Shortly after we left Haskell Hut, we encountered some friendly skiers, who told us that the trail up the Lookout had not, in fact, been broken, but that they had broken trail along the river on the IAT down to Grand Pitch. We took a pit stop at Haskell Rock Pitch to take a good look at the river. We stayed cautiously back from the edge, uncertain how sturdy the snow was. It would have been an early, cold, and dangerous end to the day if someone fell in! We continued skiing out until we met the broken trail following the IAT along the river, then ditched the pulk and our skis and switched over to snowshoes, heading out through the woods. Switching to snowshoes was a good choice, as there were some downed trees that would have been difficult to negotiate on skis. With the trail broken for us, though, we were able to snowshoe quite comfortably. We made our way past Pond Pitch, marveling at the power of the churning river whenever we had the chance to look out through breaks in the trees. We reached the Grand Pitch lean-to around lunch time and took some pictures of the massive piles of snow covering it. This was where the easy path ended, but we wanted to go just a little further so that we could get a good look at the river while enjoying our lunch. We snowshoed a little bit farther, and I began to appreciate just how kind it had been for the skiers we met to have broken trail for us. It was slow going without a packed trail! We made it down to where we could see the river, packed down a circle with our snowshoes, and settled in for lunch. We didn’t linger long, as the chill set in quickly. After filling up with fuel for the afternoon, we turned back. The return trip felt much quicker: we’d hit our stride, the trail was packed down more firmly, and the territory was familiar. When we reached the groomed trail again, we switched back to skis and headed back to Haskell Hut. 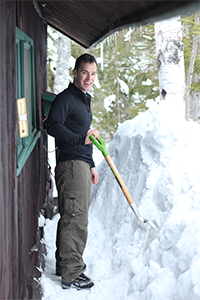 Before dark, we cleaned up some of the snow around the hut, digging a path to the propane tank, clearing off the picnic table, shoveling out the woodshed, and refilling the stock of firewood for the next travelers to come through. As evening fell, Andy made another fantastic meal—a hearty chili with all the fixings—and we settled in for another cozy evening. We were just shy of the full moon (on February 19), but both nights were so clear, the moonlight flooded over the snow outside and made it seem almost like daylight. At night, it was probably lighter outside than inside the hut, where our activities were lit only by our headlamps. Tuesday morning, it was time to head out. After more delicious oatmeal (and good, strong coffee) from Kala, we tidied up the cabin and packed up to go. It was my turn to pull a ski pulk now. I lucked out in that I got the lighter one, packed mostly with snowshoes. As someone with little experience pulling a ski pulk, I have to say that it takes some getting used to! The stability improved when we crossed the ropes, and I was surprised by how quickly I adjusted to pulling the sled behind me. Skiing beneath the view of Traveler Mtn. On our way out of the Monument, returning on the Messer Pond Road the same way we came in, we encountered two other skiing parties (and some new Friends members). I was struck by the vastness of the Monument at several times throughout our trip. There were several parties of friendly skiers we encountered over the three days of our trip, but we also encountered long stretches of solitude, during which we simply enjoyed the beauty of our environs, the peace of not checking emails, and the pleasure of each other’s company. We were on some of the most well-trafficked roads of a National Monument, but I felt that we had been granted access to something really special and, in some ways, still quite wild. As we skied the last stretch toward Matagamon Gate, I felt exhausted and refreshed—exactly what you hope to feel after a few days in the woods. I also felt lucky: not just that the weather had been so beautiful and that I had somehow landed this incredible job, but also that we had the opportunity to spend the past few days enjoying the land, the time together, and the beauty of the Monument. I returned home that night (to a long-awaited warm shower and a very comfortable bed), vowing to prioritize this kind of trip more frequently. If you have any questions about our trip or about other trips you are considering, feel free to reach out the staff of Friends of Katahdin Woods and Waters at info@friendsofkww.org. If you are interested in learning more about taking your own overnight wilderness adventure, please reach out to Susan Adams, Recreation Manager at Elliotsville Plantation, Inc, at lunksoos@gmail.com. I love winter. More precisely, I love snow – winter without snow? Blech, who needs it! Tired of the lack of snow here on the Maine coast, one recent evening I spontaneously (highly uncharacteristic; I am not a spontaneous person) decided to head a couple hours north to ski into a hut and spend a night in the middle of the Katahdin Woods and Waters National Monument. By 9 AM next morning, I had determined the huts are in fact available for use in winter, secured my hut reservation, an overnight parking pass for KWW, and dog-care at the wonderful Katahdin Kritters for my furry friend Tess. So what that it was forecast to be the coldest night and weekend of the winter yet, with below zero temperatures, I’m a New England girl I can handle it! I dug out my back-backing gear from storage, put TWO sleeping bags in my pack not being sure exactly what “hut” in this instance would consist of, and off I went! It’s a bit of a haul to get to the north end of the Monument from my home on Mount Desert Island, and I had a meeting on the way, so it was 2:20 in the afternoon before I reached the gate where I’d leave my car and set out on my skis – sadly at this time of year only 2 hours before sunset. But no problem – I had anticipated the late start, and it was plenty of time to ski the 6 plus miles (via the Old River Road trail along the Penobscot River) to Haskell Hut. Even if I lingered too long taking photos and didn’t make it before sunset, I had lots of warm gear and a good headlamp – not to mention a beautifully clear sky that would no doubt offer multitudes of starlight under which to ski – so while I preferred to arrive to a new place in the daylight to check it all out, I wasn’t concerned about darkness coming before I reached the hut. The first stretch of trail, on the Old River Road, followed the banks of the Penobscot River. It was relatively flat and easy going, and with the trees heaped with fresh snow, and the dazzling sunlight illuminating the snowy trail as well as the water smoothly flowing by, I was in winter-wonderland-heaven. After about 2.25 miles, I came to a marsh on my right and crossed a small bridge where the marsh emptied into the river. The marsh afforded a beautiful view across to the ridge of a Bald Mountain. Alongside the open marsh, there was nothing to hinder the wind, but I braved chilled fingers to take off my giant mittens and snap some photos all the same! Just past the marsh, I came to the Oxbow Road, which took me right back up to the main trail (Messer Pond – Orin Falls Road). From this point to Haskell Gate, I went up and down some gentle grades surrounded by the bare-leafed branches of deciduous trees. By now the sun was quite low in the sky, well hidden by the mountains, with dusk settling upon the landscape. The stark silhouettes of the tall trees and sharp angles of the branches were all the more emphasized by the purple sky glowing behind them. The patterns of the trees in the darkening dusk, the ever-changing light, the chill air stinging my exposed face (I had long before ditched the face mask I started with), the shusch-shusch-shusch rhythm of my skis sliding across the snow the only sound insinuating itself into the silent evening – I was totally absorbed by being in that place, in that time. Anything seemed imaginable. Lingering in the past holds one down; worrying about the future hems one in; but just BE in the present moment, and the world is suddenly full of promise and possibilities. Pure magic. When I decided to do this trip, I wasn’t sure what I would find as to my accommodations and exactly what sort of a hut this would be! But I was pleasantly surprised by how substantial Haskell Hut was – not necessarily in size, spacious enough but cozy too, sleeping eight – but well-enclosed, well-provisioned with cooking pots and pans and dishes, and games, books, and puzzles – and a rocking chair! And, most importantly, quite the workhorse of a wood stove. As soon as I arrived – after finding the outhouse and snapping a few photos as well – my priority was getting a fire going before I cooled down too much from my ski. I huddled in front of the wood stove and worked on thawing out my toes while the temperature inside the hut began its slow climb out of the single digits. It took about an hour before it was comfortable enough – standing in front of the fire – to change out of my sweaty ski clothes, and start melting snow and heating water for my dinner. By the time I ate my dinner, I had to move the rocking chair well back from the fire and take off my hat; by the time I went to sleep, it was almost TOO hot in the hut! Frankly, I was much warmer in the hut than I would have been at home in my drafty house, with the not-so-great wood stove with which I heat it. Next morning I woke in the early hours of dawn; I could have laid there forever savoring the reflective light of the not-yet-risen sun lighting the sky over Haskell Deadwater and shining its way around the trees in through the windows. But I wanted to see the sunrise properly! So, still ensconced in my sleeping bag, I threw on some boots, hat, and mittens, grabbed my camera, and headed out into the chilly morning. It was magnificent! Minus eight degrees according to the thermometer, but I was relishing the wintry air. It was so still and serene – not a breath of wind, nor a murmur of sound to be heard. I spent a good half hour watching the sun emerge and slowly light the treetops, the hut, and finally the snow beneath me. A re-warming by the stove, hot coffee, and some dried fruit and nuts were called for before heading back out for a morning ski. I made my way down the main trail to explore further along to the south. I found Haskell Rock Pitch, three-quarters of a mile down, and enjoyed the sight I’m much more familiar with in the summer, of the cascading falls of a river. I continued another mile and a half or so, completely reveling in the brilliant sunshine and utter snowiness of my surroundings. It seemed like mere seconds before my designated turn-around time forced me to head back to the hut. When I saw the hut come into view perched atop the bank of the Haskell Deadwater, it felt like a homecoming of sorts even after just a single night there. I revived the coals of the fire to make some hot chocolate, giving myself some time to linger just a bit more. But reality was rearing its ugly head, and I needed to be off. I refilled the wood I had used from the woodshed, swept up, and said my goodbyes. By this time, temperatures had warmed to the balmy low teens, so I ditched one of my layers from the day before and the morning, and set back out to the north. I couldn’t resist going the extra mile and a half to go back by way of the river again. When I reached that stretch, a small breeze afforded by the river’s proximity had both brought down quite a bit of debris to ski over, and completely obliterated the groomed trail with drifts, though the drifts were hard-packed enough to easily ski over. That wind, however, was just enough to send those cold temperatures right through my now-reduced layers of gear, resulting in my not being entirely sad when I reached my car! Plus, after not skiing all winter due to a lack of snow at home, 16 miles in two days, with a fully-loaded pack, had taken its toll on my quadriceps. Always hard to get back into the car and head back to the “real world” even after just a short time in the wilderness, but boy was I tired out! I had departed the previous day at 2:20 and strangely returned to my car at exactly 2:20 to the minute the following afternoon. Such a short time really, but so huge in its significance. And to think, I could have – and almost – stayed home, sitting around avoiding the cold, and doing chores around the house. Instead, I made a tiny bit of effort, and had the most wondrous and unforgettable experience, enjoying the wintery wilderness of this amazing place that I’m lucky enough to call home. Hope Rowan is the author of Ten Days in Acadia: A Kid’s Hiking Guide to Mount Desert Island, published by Islandport Press in 2017, as well as Ten Day in the North Woods: A Kid’s Hiking Guide to the Katahdin Region, due to be published this coming May. When not exploring the wilds of her beloved state or further afield, she resides in Southwest Harbor, Maine. This winter, we hope to guide you to exceptional experiences in the snowy Monument. If you’re a XC skier or snowshoer, you’ll want to save the dates of Saturday, March 16th to Friday, March 22nd, 2019 for the sixth annual Head North Ski Days. Head North Ski Days is a weeklong event with free ski rentals and access to groomed trails in the north of the Monument provided by Friends and Elliotsville Plantation, Inc.
Students and schools are invited to join Education Coordinator Kala Rush for educational trips into the Monument from Monday, March 18th to Friday, March 22nd. Please contact Kala at kala@friendsofkww.org for more details. More information about this annual event will be posted to the website soon. We have an important update on road closures from the National Park Service. Due to snow, the Loop Road gate and the North gate at Katahdin Woods and Waters National Monument have been closed to motor vehicles and will remain closed for the winter season. For important updates about road conditions, you can always visit the current conditions page on the Katahdin Woods and Waters National Monument NPS website. The National Park Service (NPS) will host a public meeting on November 14, 2018, to continue the conversation on the on-going management planning process at Katahdin Woods and Waters National Monument. Similar public meetings were held in Presque Isle on October 17 and in Bangor on October 30, 2018. Future meetings on the planning process will be held throughout 2019. Patten, ME — An annual tradition of showcasing the dark skies of the Katahdin region will continue this year at Stars Over Katahdin on Oct. 6thand 9th, hosted by Friends of Katahdin Woods and Waters (Friends) and Elliotsville Plantation, Inc (EPI). Stars Over Katahdin will feature an exhibition of the United States’ darkest skies East of the Mississippi for the general public, while the educational events preceding will provide opportunities for students of the Katahdin region to learn about the stunning nights skies of their hometowns. The events take place as supporters of the Monument push to conserve the extraordinary night skies as an International Dark Sky Sanctuary as designated by the International Dark Sky Association. As part of the place-based education program Katahdin Learning Project, students at Katahdin Elementary and Myal Oprick Elementary will be treated to presentations on the night skies from Northern Stars Planetarium. John Meader, Director of Northern Stars Planetarium in Fairfield, will be presenting age-appropriate lessons on the stars, planets, and distant galaxies to students inside a large inflatable dome designed for projections of celestial objects. Programs at Katahdin Elementary will take place September 24that 9:45am, 12:15am, and 5:00pm. Programs at Myal Oprick Elementary will take place September 25that 9:00am and 10:15am. These events are closed to the general public, but open to press upon prior request. On Saturday Oct. 6th, Friends of Katahdin Woods and Waters members and Monument Volunteers Eric and Elaine Hendrickson of Presque Isle will be leading a guided day hike exploring the history and geology along the banks of the Wassataquoik Stream north to Orin Falls. Hikers will meet at Sandbank Stream Campsite to carpool at 10:30am. Hikers with small children or a part of a family are welcome to meet Katahdin Learning Project place-based educator Scarlet McAvoy for a Family Hike at Sandbank Stream Campsite at 2pm with an optional picnic to follow (families provide their own food). Those interested in the Family Hike are invited to RSVP to smcavoy@rsu89.org. Saturday evening, astronomers, Monument volunteers, and star enthusiasts will gather at the Loop Road Overlook at Mile 6.4 for a campfire program (s’mores included) followed by a guided telescope viewing of the stars. Carpools and a reservation-only shuttle bus will be meeting at Sandbank Stream Campsite at 5pm. Those interested in shuttling to the Overlook should contact Susan Adams at lunksoos@gmail.com to reserve a spot on the shuttle. Event attendees planning to camp out for the night in the Monument should be aware that campsites within the Monument are likely to be full with other visitors that weekend. Friends suggests attendees hoping to stay overnight book accommodations at the nearby Pine Grove Campground or at other local accommodations. Tuesday, Oct. 9th at 7pm, the Millinocket Memorial Library will be showing an early screening of “Saving the Dark”, a film directed by Sriram Murali about night skies and the increasing effects of light pollution. Stars Over the Katahdin takes place while Friends, EPI, and the National Park Service continue their collective effort to have the Monument designated as a Dark Sky Sanctuary by the International Dark Sky Association. The efforts to conserve the night skies of the region were previously covered in the Portland Press Herald’s feature “Let there be dark: Advocates push Maine as astrotourism destination” and The County’s article “Dark skies a resource to protect”. Light pollution maps show that this part of Maine is home to a patch of dark skies larger than any other in the United States East of the Mississippi River. Katahdin Woods and Waters National Monument sits in the heart of the dark skies of northern Maine. With a total eclipse expected to move directly over the Monument in 2024, dark sky advocates pushing for the International Dark Sky Designation hope Katahdin Woods and Waters can be a major destination for astrotourists from across the world. Fort Fairfield, ME – Katahdin Region students came together again to volunteer as the tent and porter crew for BikeMaine 2018: Acadia in the St. John Valley – La Terre Entre Deux (the land between). Students take seven days, including five away from school, to work setting up and taking down tents. They join cyclists for each meal, learn from a place-based curriculum in the afternoon, and then camp out each night in “tent city.” The week is facilitated and supported through multiple partnerships ranging from the Katahdin Learning Project, a place-based learning initiative offering educational opportunities at the Friends of Katahdin Woods and Waters, to Elliotsville Plantation, Inc. The work could not be done without the amazing teacher chaperones from Katahdin Middle High School, CariLynn Hanson and Kyle Quarles. 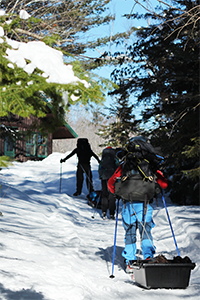 Katahdin region schools such as Katahdin Middle High School have the opportunity to jump on board in order to offer students this week-long learning adventure. What is the Katahdin Learning Project? The Katahdin Learning Project, a project of Friends of Katahdin Woods and Waters, works to create educational opportunities through place-based learning in the Katahdin Region, using Katahdin Woods and Waters National Monument and the surrounding communities as the backdrop. MISSION: The mission of the Katahdin Learning Project is to foster and support authentic teaching and learning in the Katahdin Region that engages students in real projects in the community and the wild and natural places surrounding them. VISION: We envision a future where our youth, public lands, and education will unite us, create vibrant communities, and ensure a prosperous future for the Katahdin Region. Why do we partner with BikeMaine? BikeMaine offers participating students a rare opportunity to learn through hands-on activities in nearby communities with a curriculum created by teachers and partners in order to enhance and provide the best and most educational experience possible. The crew also earn a substantial stipend for programs at their school, like resources for their outdoor education program. Partners including Katahdin Learning Project/Friends of Katahdin Woods and Water, Elliotsville Plantation, Inc., Katahdin Middle / High School, and BikeMaine.